A recent trip to the UK meant staying overnight in Tain l’Hermitage, a town that is about an hour south of Lyon. Close by is Crozes Hermitage, well-known for its excellent wines, but for me, the main attraction of the area was the Valrhona chocolate factory!! I had timed my visit to Tain l’Hermitage so that I would have the afternoon to indulge in visiting the Cite du Chocolat, the interactive chocolate “museum”. The impressive building sports a huge version of the iconic black chocolate box, which was introduced by Valrhona in the 1970s. The side of the building also looked as though it had been decorated with over-sized chocolate boxes!! Inside, it is ALL about chocolate! And here’s a tip – at the entrance, opposite the cash desk, you’ll find lockers, where you can put your coats and bags. Use them! It’s a lot more fun to go around the exhibition without having to carry anything! Dulcey is a white chocolate with a caramel flavour, and Jivara is a milk chocolate! I’m not normally a fan of white chocolate, I find it too sweet and cloying, but I’ve become a fan of Dulcey!! And Jivara was very delicious too! One of the exhibits explained the processing of cocoa beans from the arrival at the factory to the finished product. The videos showed the various stages of production, with comments by Valrhona employees. At some of the stages there were little tastes of chocolate, including some 100% cocoa chocolate and pure cocoa butter. The 100% chocolate tasted very bitter but there were all kinds of fruity notes and it was energising in a caffeine way!! The cocoa butter had no taste at all! The little oval pieces of chocolate are called feves and are made for the professional market. Because of their shape they melt readily. The big blocks are also aimed at the professionals, but there’s nothing stopping you from buying either of these products in the shop at the end of your tour. At the bottom of the stairs to the first floor (2nd floor US) was the machine in the picture below – a chocolate enrobing machine!! The machine covers passing bits of “candy” (squares of praline in this case) with melted chocolate. The big tank below the conveyor belt holds melted chocolate at a temperature of 44.5 degrees centigrade. An ingenious pumping system cools the chocolate to 28 degrees centigrade, before warming it again to 31.5 degrees centigrade, at which point it is used to enrobe. Any excess chocolate runs back into the tank where it is heated once more and so on. The process of heating, cooling and heating is called tempering, and it results in a finished chocolate that has a nice shine and cracks when bitten into it. On the first floor were displays of how Valrhona chocolate could be used in various desserts, cakes and Belgian style chocolates. AND of course there were more chocolates to be tasted. Another display showed the development of the company, which was founded in 1922. 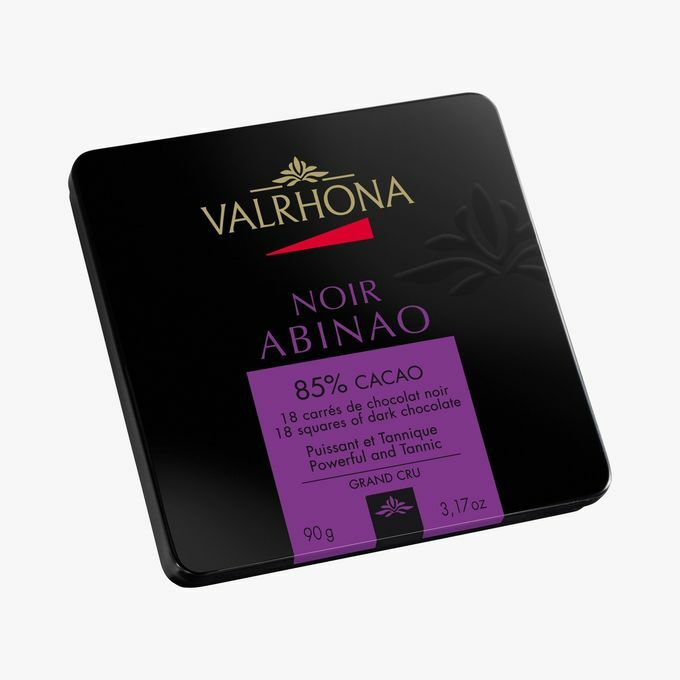 In the early days, Valrhona chocolate was only sold to professionals. Old packaging, publicity items and tools were also on display. At the start of my visit, when I bought the entrance ticket, the cashier asked if I wanted to participate in a half-hour workshop – the theme was praline. I’m always interested in learning new things, so for an extra Euro I got my ticket for that workshop! Praline is made from sugar and nuts, usually in equal proportions. The sugar is either caramelised, with the nuts added when the caramel is a dark amber colour; or sugar and nuts are “cooked” together until the sugar starts to melt. The two different types of preparation give very different results, but in both cases the sugar/nut mixture has to be ground for several hours, in order to obtain a smooth praline paste – not something that I would want to do at home! The resulting praline has a 45% fat content (from the nuts). Finally it was time to visit the shop!! I had visited Valrhona a long time ago, before the Cite du Chocolat had opened, so I knew that the shop was an Aladdin’s cave of chocolate and more chocolate!! After my visit at Valrhona had ended, I went for a little walk along the Rhone – the name of the chocolate factory is an amalgam of Rhone Valley, and the river is close by! Getting to Tain l’Hermitage is easy – the town is just by the A7 motorway, about an hour’s drive south of Lyon. From Saint-Chinian the drive takes just three hours. Tain also has a railway station, and the chocolate factory is only 800m from the station!! The Cite du Chocolat is open seven days a week, and it is better to visit in the early morning than in the afternoon (fewer people). I stayed overnight at the hotel Pavillon de l’Ermitage – a very comfortable hotel with spacious rooms, halfway between the railway station and Valrhona.